Add 3-4 ice cubes to a cocktail shaker. Add whisky, vermouth and bitters. Shake. Shake it up! There’s a reason why the Manhattan is such a classic cocktail. It’s simple to make, delicious and packs a boozy punch, pretty much the perfect combo when you’re in the mood for a stiff one. When you want to shake up a Manhattan Cocktail, all you need is three ingredients, a martini shaker and a glass. Note: though Manhattans are traditionally served straight-up, you can make the same recipe and pour it into a rocks glass with ice. Gather your ingredients. Then add 3-4 ice cubes to a cocktail shaker. Pour two ounces of whiskey into the ice. You can use your preferred brand. Then add one ounce of sweet vermouth to the mix. Add two dashes of bitters to the shaker. The traditional recipe calls for Angostura bitters, but feel free to experiment. Place a pint glass into the top of the shaker so that it acts as a cap. Shake vigorously. If you don’t have a shaker, you can stir the ingredients with a spoon. Strain the ingredients into a martini glass. If you prefer your Manhattan on the rocks, strain it into a glass with fresh ice. Don’t reuse the ice from your shaker. Garnish with a single maraschino cherry. Channel your inner Don Draper and enjoy! 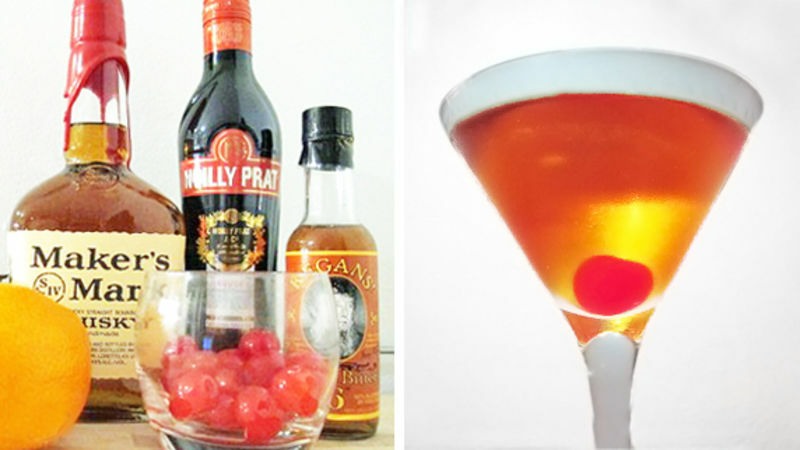 For more detailed information about the Manhattan, history and variations, also check out How to Make the Perfect Manhattan. nybarfly knows his drinks and also where to get the best sauce in Manhattan. Check out his blog site, NYBarfly and his Tablespoon profile — be sure to continue to check back for more tips and suggestions for discovering new bevvies.